Terrible Service Still Gets 18%? The other night a group of us (14 adults) met up for dinner at a semi-swanky restaurant. We all had been looking forward to this evening for months and were excited to try this new restaurant that had great reviews. Well…. the service was terrible! Most of our orders were wrong, we had to beg for water/drink refills and the waitress just did not seem to care one bit. 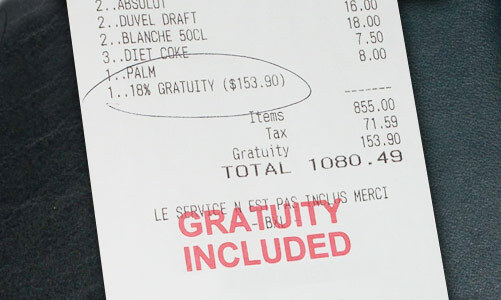 Of course at the end of the night we received our bill which included a mandatory 18% gratuity. After the horrible service it seemed like a total slap in the face. Of course we paid it begrudgingly and left. It’s been almost a week and I’m still annoyed at wasting money on that “service”. If it were to happen again, what would you do? Without a doubt, Dharma’s advice would be to speak to the manager or owner. And in fact, I don’t think it’s too late to do that even in this scenario, let alone should it happen again. Any person running a business needs to know when there’s a member on their team that could drag them down, and that for sure is this waitress. Look, the bloom can wear off a new restaurant pretty quickly in this climate of foodies who know their stuff, and what with all the social media these days, “word of mouth” takes on a whole new meaning. Business owners know this, and it matters. So seriously, I would still give them a call, and give them the information they need to properly run their business. Don’t go in looking to be reimbursed, that ship has likely already sailed… Although, you never know… a good manager should offer a gift card to try and regain your business… But don’t make that the point of your call.